Back to the Homepage of Factorial Algorithms. You might also whish to visit our FactorialCalculator page and see how today an ultrafast calculator works. 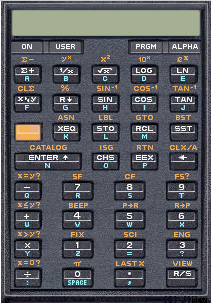 Once upon a time Hewlett-Packard build RPN-Calculators, like the legendary HP-41C. Even today you can put an HP-41 on a Windows desktop and use it like in the good old days. The (virtual) Hardware by Warren Furlow and Software. And here you can find many other calculator emulators. In 1977 Peter Henrici decscribed in Computational Analysis with the HP-25 Pocket Calculator a simple routine for calculating the Gamma function Gamma(x) = (x-1)!, x > 0, x real. Henrici used the Stirling formula tuned by the QD-algorithm (a Padé-approximation). With minor modifications this becomes the following code for the HP-41C. Maybe a creative reader joins this friendly competition? (Please send me your solution.) Alternatively, you can use a very modern approach which combines object-oriented and functional programming (note the use of lambda expressions below) and use the cute little program below (written in C#), which simulates this evaluation of the factorial on the HP-41 calculator.